This recipe was created in partnership with Sprouts. All opinions are my own. Breakfast food is my JAM. I love it the way Leslie Knope loves waffles. Most mornings we keep things simple, but on the weekends, I love planning 1-2 ideas for the week ahead. Muffins are a perfect option for breakfast, brunch, or breakfast for dinner. They’re AMAZING on day 1 straight from the oven, but they also freeze like a DREAM, which makes them a great candidate for meal prep. Even on a busy morning, I can pull one out, warm it up, and feel like the nice mom. 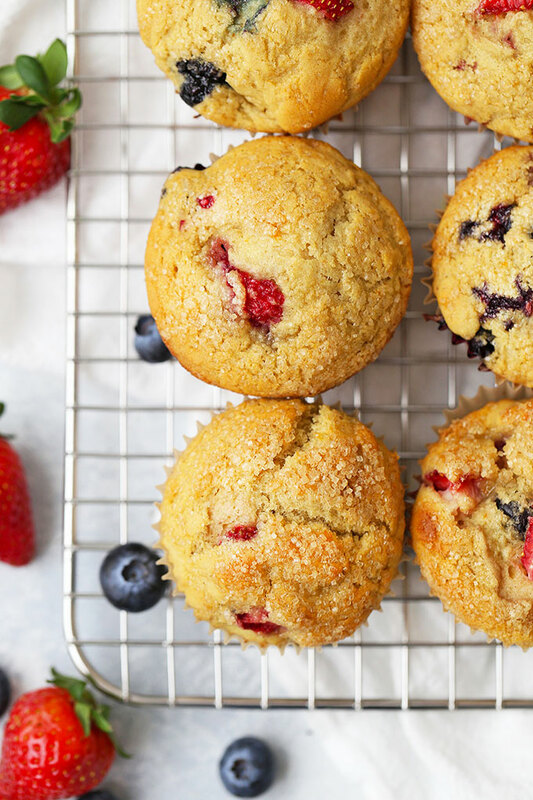 These Orange Triple Berry muffins are a perfect example—light, fluffy texture, studded with fresh berries, and a little kiss of citrus. Plus, that little crunch on top? Fuhgettaboutit. Gluten free or all purpose flour. I use a measure-for-measure gluten free baking mix which is interchangeable with white all-purpose flour. You can use whichever you need! Orange zest, Orange Juice + Milk. 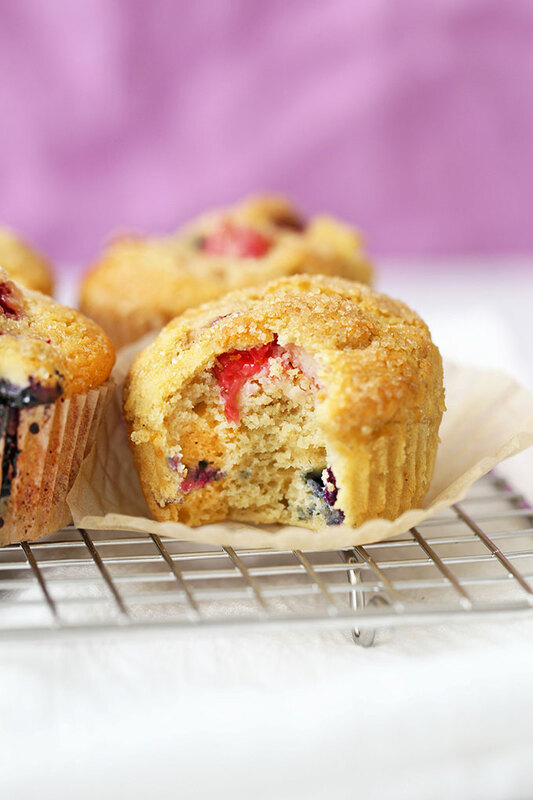 The brightness of fresh orange zest MAKES these orange triple berry muffins. The citrus notes are beautiful with the berries and brighten everything up. Then, we use the orange juice combined with a bit of milk for a buttermilk effect, which adds to the extra light + fluffy texture. We’re dairy free, so I opted for unsweetened vanilla coconut milk this time. SoDelicious makes a GREAT one. It’s much lighter in taste and calories than canned coconut milk, and the vanilla is especially lovely in the muffins. I get it at Sprouts in my weekly Instacart order–easy peasy! Avocado oil + eggs + honey. I played with the amounts here over several trials and landed on the sweet spot. With just enough of each, they’re light, fluffy, golden, and just sweet enough to let the berries truly shine. Baking powder + baking soda + salt + vanilla. All the usual suspects for muffins. 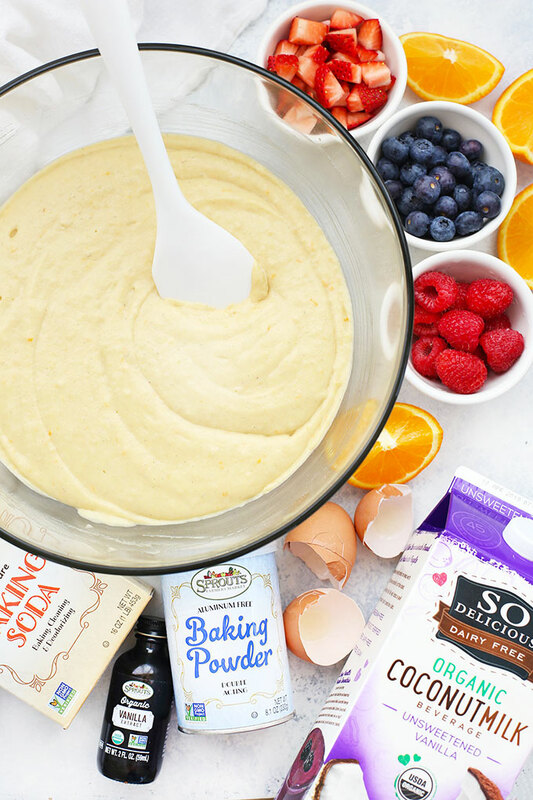 The baking powder gives plenty of puff and baking soda reacts with our orange “faux buttermilk” for extra light, fluffy muffins. Salt and vanilla balance it all out. Fresh berries. 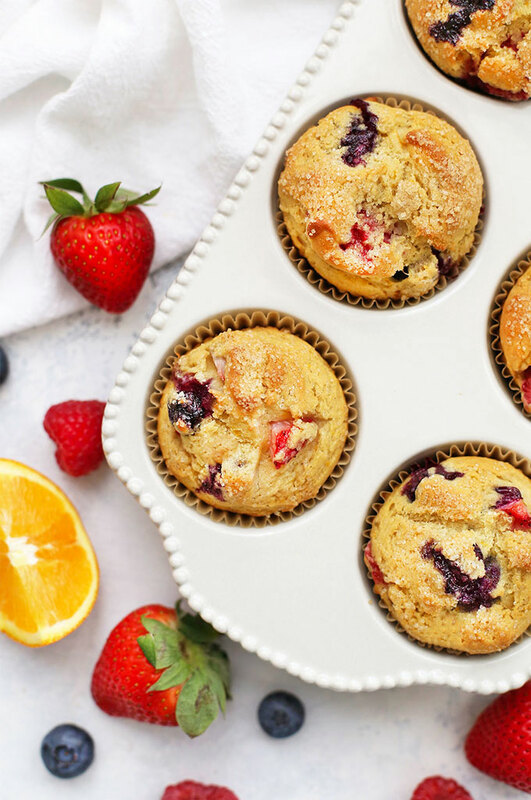 These orange triple berry muffins use a combination of fresh strawberries, raspberries, and blueberries. The effect is beautiful and the flavor is so fresh and bright. I love this trio together (especially with the citrus! ), but you can opt for 1-2 kinds of berries if you prefer. Sprouts always has the BEST selection for fresh produce! A little coarse sugar on top. It’s optional, but I recommend it if you can! 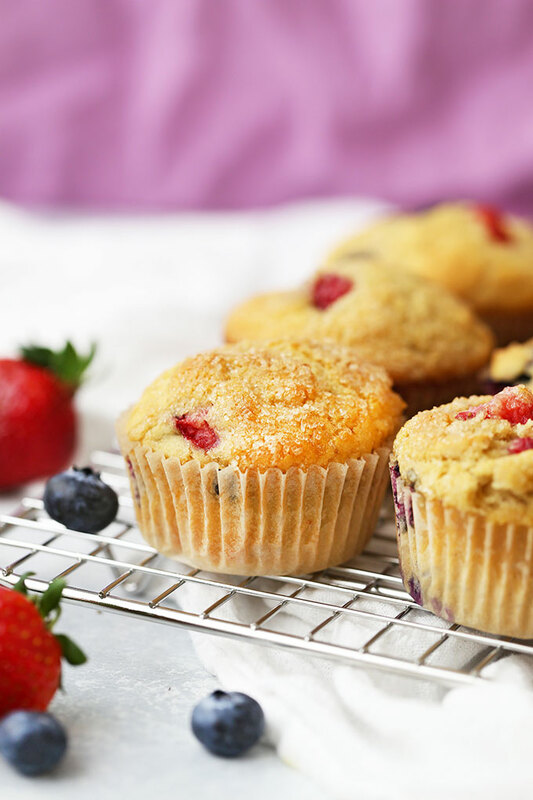 You only need about 2 tsp for the whole batch and the crackly crunch and sparkle it gives the tops of the berry muffins is worth it! Choose your muffin pan – The type of muffin pan you use will impact how much or little these muffins brown. If you’re using a metal pan, dark metal will cook deeper and darker than a light metal one. I tend to recommend lighter colored metal if you go that route. For ease, I also really like using a silicone muffin pan, which makes clean-up a breeze. Can I use lemon instead of orange? Yes! It’s delicious. You can choose whether to add lemon juice as well or stick with the orange juice. Either way, it’s yummy! 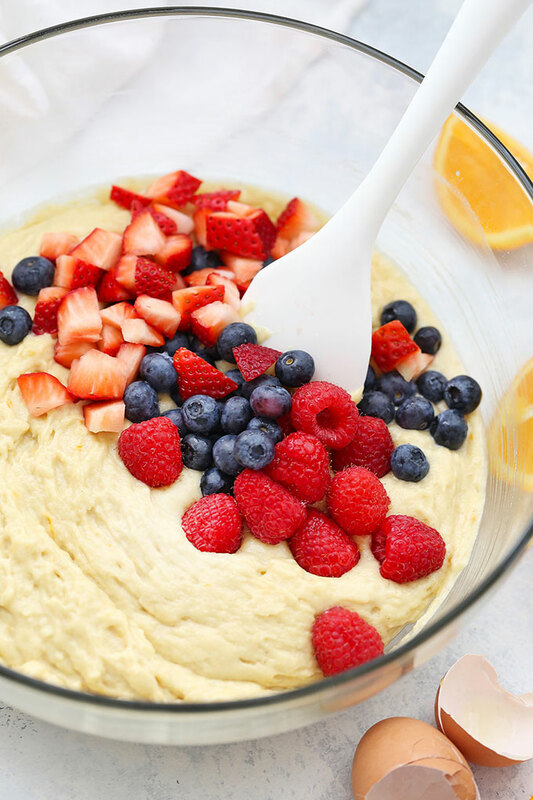 Do I have to use a mix of berries? Nope! You can certainly use all one kind of berry or a mix of 2-3 kinds. Whatever you like. Sophie likes when I do 100% raspberries. 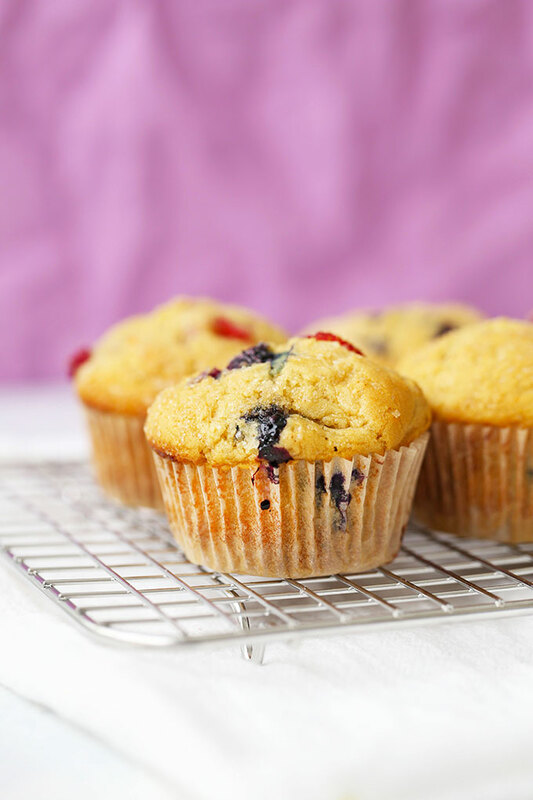 Will frozen berries work in muffins? Yes, but they do have a tend to “bleed” in the batter. They’ll taste great, but the texture will be a bit more moist and the berries (particularly blueberries) will likely color the batter a bit. Can I make these with regular flour? Absolutely. I use a measure for measure gluten free baking mix, so you can substitute white flour instead of the GF flour as needed. What other milk can I use? If coconut milk isn’t your jam, SoDelicious also carries almond, cashew, and almond/cashew milk blends that work great! Most of their milks come in shelf stable and refrigerated versions, so it’s easy to always have some on hand! Can I make them vegan? I haven’t tried it yet, but I’d start with a powdered egg substitute over a flax or chia egg for the fluffiest texture. PS – Check out all the best deals and new products at Sprouts.com. They even offer grocery pick-up or delivey to your door in many areas! 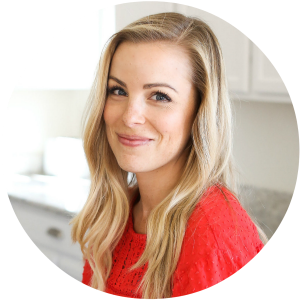 They’re my go-to stop for vibrant fresh produce, gluten free & dairy free favorites, and SO much more. Preheat the oven to 400 degrees F. Grease a muffin pan with spray oil or line with paper baking cups. Zest your orange and place zest into a liquid measuring cup or bowl. Add about 1/4 cup orange juice (this can be the juice from the same orange you zested) and enough milk to make 1 cup. Stir together, and let it sit for a few minutes while you prepare the other ingredients. Add honey, avocado oil, eggs, and vanilla. Stir to combine. In a large mixing bowl, whisk together flour, baking powder, baking soda, and salt. Gently fold in the fresh berries. Scoop batter into 12 muffin cups. If desired, sprinkle the tops of the batter with coarse Turbinado sugar. Bake at 400 degrees 17-20 minutes or until a toothpick inserted in the center comes out clean. Let cool 1-2 minutes in the muffin pan before transferring to a cooling rack. *You can use whatever milk you drink here–almond, cashew, oat, soy, dairy, etc. **You can substitute melted butter, vegan butter, or another neutral oil for the avocado oil. Half way through baking I turned the muffins, and when I opened the oven door, they were all ready browning. Unlike the picture which is a light color. Next time I will decrease the temp. But, they smell heavenly and look awesome. Bake up nice & tall, not spreading out all over. Will definitely try again. 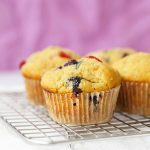 I made these muffins and they are so light and flavorful! I loved the subtle orange and did a mix of blueberries and raspberries. I baked mine for 17 minutes and they were a tiny bit burnt so next time I will try 15 min. My oven runs a little hot but thought I would mention it in case it helps others watch their muffins more carefully toward the end. Thank you for a great recipe! Holly – I’m SO glad you enjoyed them! Thank you so much for sharing this! I do not know what went wrong but mine came out wet and soggy at 17min. I left them in there an extra three and still the same. The only substitution I made was almond flour. Nora – I’m positive it was the almond flour. It doesn’t behave the same as gluten free all purpose flour and you would have needed to adapt the recipe in other ways for them to work. Almond flour is much more moist and doesn’t absorb liquid like gluten free flour does, so they’d definitely end up wet if you made them using almond flour without adapting the recipe. Almond flour is not a direct substitute for any other kind of flour without other adaptations in most baking recipes. I’m sorry!